The game started with the Dogs pushing on the opening shift before then getting caught in their zone on an icing on back to back instances. The game continued to be fairly tight through the first half of the period, with neither side looking especially sharp or being able to generate much in the way of sustained pressure. The Grizzlies would open the scoring just short of the midway point of the period at the end of an attacking zone shift that saw Riley Hughes power out of the left corner before putting a cross-ice pass into the right circle where Jeremie Bucheler found it and beat John Hawthorne with a quick release five hole. Lach Hadley also drew an assist on the play at 9:21 of the first. The Grizzlies would earn a power play four minutes later and looked dangerous on it, but Hawthorne and the Bulldog penalty killers stood tall to keep it a one-goal game. There would be no further scoring through the period, with the Bulldogs having several great chances turned aside by Kurtis Chapman to protect the lead. Shots in the first were 15-13 Bulldogs. The second period was similar to the first, with the teams trading chances and the Bulldogs continuing to get their opportunities but through the middle of the period being unable to beat Kurtis Chapman despite two power play opportunities. The lead stood until the back-half of the period, with Chapman making a fantastic diving save with his paddle to keep it 1-0 with 6:22 remaining in the period, but injuring himself on the play. The Dogs would continue to push, and tied the game with Keenan Rancier making a couple good saves in the first few minutes of relief. He wasn't to blame on the one that beat him, as Spencer Hora kept the puck in at the right point and put a perfect D-to-D pass to the left point for Marcus Walter. He would get a low shot on goal, that Ryan Miotto deflected inside the far post on the doorstep to make it 1-1 at 14:05 of the second. The pace would pick up almost immediately after the goal, with Hawthorne coming up with two good saves, while Chapman returned to the net after receiving attention. Neither team would find the net, as it remained 1-1 after 40 minutes. Shots in the frame were 18-13 Bulldogs, for a 33-26 Bulldog advantage. 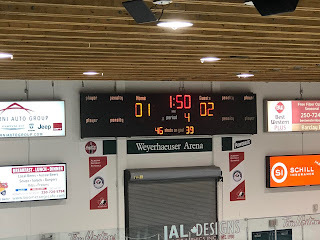 The third period seemed somewhat similar to the first two through the midway point of it, as neither team could find the net or manage to sustain any extended pressure in the attacking zone. The Bulldogs came up with a penalty kill to keep it tied, before attacking on the rush with a great chance at the net that saw Chapman stop Grayson Valente in tight. The teams didn't give up much either way through the remainder of regulation, with the best chances maybe coming in the final minute, as John Hawthorne came up with a big glove save on Alex Newhook. At the other end, Aaron Bohlinger drove the net but couldn't get a banker to beat Chapman with under 10 seconds to play. Third period shots were 12-10 Bulldogs, for a 45-36 lead after 60 minutes. Overtime wasn't the prettiest to watch, with the Bulldogs having the initial possession but being unable to generate and opportunity. The Grizzlies would have back to back possessions off faceoffs, but couldn't generate much either as they repeatedly exited the attacking zone to attempt to generate a chance on the rush. The Bulldogs would win possession off a save by Hawthorne that saw Alex Newhook run him over on a net drive. They attempted to attack on the rush, but Alex Newhook made a nice defensive play to strip the puck and attack on the rush. He would draw a delayed penalty, but it didn't matter as he entered the zone on a 2 on 1 up the left wing where he put a perfect cross-ice pass onto the tape of Alex Campbell who one-timed it up and over Hawthorne for the game winner at 3:10 of overtime. Overtime shots were 3-1 Grizzlies, for a game total of 46-39 Bulldogs, with John Hawthorne earning 2nd star honours with the loss while Kurtis Chapman earned 1st star honours with the win. Each team went 0 for 2 on the power play. The Bulldogs are next in action Friday in Salmon Arm.